Lens construction comprises 17 elements in 12 groups including three aspherical and three ED (extra low dispersion) elements. 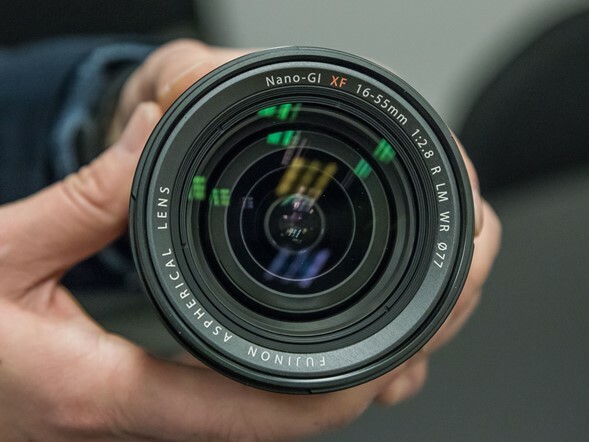 New in the 16-55mm is a 'Nano-GI' coating which Fujifilm claims reduces flare. It seems safe to assume that this is similar to Nikon's Nano Crystal coating and Canon's SubWavelength Structure Coating (SWC), and is designed to reduce flare and ghosting. Not another "proof is in the pudding" what do you think this means? The saying is "the proof of the pudding is in the eating" it means you can't judge the pudding by looking at it - you have to eat it to tell if its any good. Its the right saying to use but use it properly - you are meant to be professional :) Hopefully you'll "pull out a plum". Nice. I'll be interested, though, in seeing the IQ compared to the 18-55, non WR, light, small, Fuji lens :). Which I got bundled with a camera so it was half price. I like Fujifilm and I had a XE2 for a couple of months, I like the Xtrans sensor that can produce clean and smooth color correct pics in the entire ISO range, my middle class APS-C DSLR had hard time to follow beyond ISO 6400. What I don't like about Fujifilm is the flat, slippery grip-less body, combine with this f2.8 beast would be a nightmare to me to use, the combo would be too much front heavy. Can fujinon lens 16-55mm f2.8 be used in FUJIFILM XM1?? Thanks for the answer.. Exactly. That's the only reason I don't have an a6000. No mid-range zoom, except for $1000, and even that isn't a great lens. Sadly, physics gets in our way yet again. Going mirrorless would only make a difference in lens size if the sensor is smaller, like in M4/3's. For an APSC sensor the lens still has to cover the larger area with a radius of light. So the lens will be the same size as the flippy mirror competition. You should maybe take a look at the Olympus offerings but they are expensive and not much smaller.. Massive is a relative term. It's still smaller than a full-frame sensor lens would be. A Canon 400/2.8L IS is massive. A 16-55? Not so much. This is very similar in size to the 17-55mm f/2.8 Nikkor for APS-C and uses the same 77mm filter size, though it is a bit lighter. I like primes as well, but a fast midrange zoom is a great lens for events and photojournalism, and can get you the shot you wouldn't have time to switch lenses for. The overall system with camera body is more compact than Nikon's APS-C since the flange distance is shorter by quite a bit. This lens is a tad wider, and quite a bit less expensive than the Nikkor. Looks like a great offering and definitely brings the X system up a notch. You don't need it on a wide zoom. I do. My nerves are shot. And people say the M.Zuiko 12-40 is big with a 62mm filter thread - be interesting to see how the optical performance works out. Indeed! The 12-40mm is only 382g. It's only "large" with respect to the micro four thirds system--certainly not with respect to APS-C equivalents, not to mention full frame. This Fuji lens is 655g! The Samsung 16-50mm f/2.0-2.8 is 622g. Etc. (the Samsung is brighter and has OIS. All 3 have weather sealing). "The XF 16-55mm F2.8 R LM WR is a solid lens, and relatively compact for a 24-83mm (equivalent) F2.8 optic at its wide angle position." 24-83mm (equivalent) should have an equivalent aperture of F4.2 (1.5x crop factor). F-number will be readjusted when there is a conversion of focal length equivalents, so don't expect it to behave like a F2.8 on a full frame. Instead, it will look like a 24-83mm F4.2 on a full frame. I'm sure you like your full frame system and your f/1.4 primes and 200mm f/2. I'm quite grateful to have exposure and angle of view equivalence to a very useful 24-70 f/2.8 in my APS-C system, and get really bored having this line of posts cluttering up the APS-C and MFT and 1-inch sensor threads, thank you very much. I noticed on the second photo, you can still see a seam on the inner barrel. Does that mean plain old plastic is used like on the inner barrel of the XF 18-55mm R LM OIS kit lens? I thought these pro red-square lenses would use metal inner-barrels like most of Canon's L-series pro lenses. I'm bummed out....No IOS for this lens. I was looking forward to purchasing the XT1 with this combo. I agree. yet with OIS it might be even heavier and more $$. If only it were a 14-55 2.8... I can dream on right? Pity Fuji doesn't do IBIS. As for "advantages of mirrorless systems", are we forgetting a big one, IMHO...The lack of AF Adjustment (or AF Fine-Tune, as some call it)! In other words, since the mirrorless systems focus right off the sensor itself (no reflex mirrorbox like in a DSLR), assuming the system and lens are not faulty, the Focus is always spot-on....There can be no "back-focus" or "front-focus" issues, again, assuming the system and lens are not faulty. That, to my 57-year-old eyes, is of critical importance, if "Sharpness" is a criterion of one's photography. Thank you. Unfortunately, even for mirrorless, its the camera that picks the focus point (even for spot focus) which may or maybe not be what you want, so front/back focus still exist, but unless DSLR, there will be at least one part of the image be in focus. Nevertheless, the in focus rate is probably higher than DLSR. Looks like a Tokina design. Lots of similarities with the Tokina 16-50mm f/2.8. You want small body AND lenses ? You can't get all. If you choose APS-C, you will get equivalent lens size/weight, mirrorless or not. Because mirroless change mounting flange distance, nothing else. Mirrorless has strictly no impact in lens design size/weight over reflex. When you get very small APS-C lenses,it is because they have reduced aperture (f4 vs f 2.8) or reduced quality (like sliding storage position). If real world quality follow the specs, it is an amazing lens for a very small size. You want smaller ? Go m43, it is the only other way i see. I heard wideangle lenses can be made smaller on mirrorless. Not sure can be small for fast zoom tele lens on m43? I never seen a small APS-C wide angle at f2.8, mirrorless or not. Mirrorless just remove mirror, it doesn't change optical laws. - make collapsing design, but it reduce quality (never seen a tack sharp collapsing pancake lens) and still normal when in use. And those lenses are never fast, too. You can't fight against optical laws, light wavelength and such. Re: You state that you have never seen a small APS-C wide angle at f2.8. Might I respectfully suggest taking a look at the Sony SEL16F28 SEL-16F28 16mm f2.8? Pancake lens indeed. >> Mirrorless just remove mirror, it doesn't change optical laws. True, but in removing the mirror, you get the opportunity to place wideangle lenses closer to the image sensor, which reduces their length. You also get to use fewer elements in the design, since there's no need to move the optical centre of the lens to keep it out of the way of the mirror. Therefore, smaller and lighter lenses for a given focal length and aperture (though the reduction isn't as much as you'd expect because the AF mechanism, electronics etc still need to be the same size - cf Leica M lenses). This doesn't apply to telephoto lenses as their long focal length places them farther from the sensor anyway, mirror or no mirror. bet its a great lens, looks perfect on the xt. I don't get all the complaining about size. Size is one reason I didn't buy the X-T1 for. And it's not the reason most models will be mirrorles eventually. I see no advantage to have a small mirrorless camera with a big (quality) lens. The advantage is not having a mirror useless and noisy .. The advantage is to have an electronic shutter silent .. The advantage is to have a preview of shooting on the viewfinder .. Indispensable with strong differences of light. Really the x-t1 is too compact .. it would take a grip bigger inside with a much more powerful battery .. For the rest are .. mm .. The advantage is having a small camera body. This lens is to large and heavy. It just does not fit the camera form factor. If I want large and heavy I just stay with Canon or Nikon. It would fit just fine on the X-T1. I don't get all the whine about size for mirrorless. There are more advantages to mirrorless than the possibility of a smaller camera. I don't care about the size, but I don't want a DSLR with the state of mirrorless these days. the whole mirrorless sell in the beginning was the size argument. Now, bigger mirrorless is OK... people tend to twist and turn to actually self convince themselves. Well I've been sitting on the fence as to go with Fuji or Sony for my next camera (trying to downsize from a D600+24-70 F2.8 and 16-35 F4, 70-200 F2.8 and lots of other goodies). All the talk about Fuji lens quality had me leaning towards the Fuji, but the release of the A7ii has become more tempting with in-body stabilization. A 35mm size sensor would technically mean heavier and bigger lenses, but Sony seems to be trying to keep things small (partly by staying at F4). Of course, they also now have the in-body stabilization which could mean smaller lenses too. Imho, the first mfc releases an IBIS Mirrorless sub-frame body will be a hit in 2015, it even better if it is a WR body. May be that Fuji will release a IBIS WR body b/c this FUJI WR 16-55mm has no OIS regardless 16-55mm may be the most popular FL for walking around. I bought a second-hand XT1+grip+18mm f2 prime (27mm equivalent) and checked it against my D600 +24mm f2.8 prime. If there were differences in image quality, it was in the lenses. Both systems seemed equally sharp at 100% in the middle but the Fuji 18mm I have looked very slightly softer at the edges (which is maybe why I was able to pick up this cheap Fuji lens for even less—I'd like to see Fuji produce a high-end 24mm equivalent prime with min aperture of at least f22). With the D600+24lens/filter/cap weighing at 1124g and the XT+grip+18mm lens/filter/cap at 672g, the XT is definitely better for traveling lighter. I cannot wait to look at this 16–55 f2.8 as the WR and OIS should make this the lens to hike with, never mind size and weight. I tried the Oly OM5D + M43 system but did not like it, though many others get great results with M43. The Sony offerings look tempting, but I don't do video and have no pro need for full-frame quality. "If there were differences in image quality, it was in the lenses." OIS used with a wide angle lens is a bit of over kill. The rule of suite speeds is to use your FL say 18mm as 1/18 of a second or faster. If you shoot a 1/4 of a second, hope your subjects a dead or still life, OIS does not make up for subject motion. In tele I can see the advantage . But a well trained photographer can get away with 1/30 to 1/60 in low light. I did with my Nikkor 105 F2.5. OIS in wide and normal range is for the trained. The other two lens Fuji offers look fine, the 16-55mm F2.8 is a choice for someone who knows want they want and how get out it what they need. I will bet'cha this lens is going to have great reviews! But one should also have deep pocks, this not a lens to just 'get' and leave in your camera case. you love reading yourself post. Now three options as general purpose lens on Fuji X-mount system. This is double the weight and price of 18-55mm without OIS and with WR. I was at an event last night where I had the 23, 56 and 55-200. At a point I needed that 55-200 to perform and it did not do well. I really needed the f stops to make up some ground. I was shooting at 1600 I think. I could not use flash from my position, it would have been ineffective. This is where the 16-55 and 50-140 comes into play. 18-55 for me. It's a great and light lens. Nice match for my Xpro-1 for travel. The new lens is almost the size of my Canon 24-70L MkII so can't see the value in having two heavy zooms. @ryan mate, you should up the ISO to 6400 .. X-Trans is quite good to cope up with it. there will be slight noise creep but is not massive, I would bump up ISO over getting blurry images. I second ryan2007 because I have the 18-135 and am tired of switching to my 56 or even 16 in low light .Was thinking of selling the 18-135 but hope it distinguishes itself from the 16-55 2.8 and the 50-140 2.8 (both of which I am going to purchase).Right…I know…which one are you going to leave at home when you travel tscholent? tscholent .. 18-135 has a great OIS and awesome range and very well weather sealed. It's perfect as a walk-around lens. otherwise i agree you may like to get the f/2.8 combos, or at least 50-140 as otherwise you already got some nice primes for even better low light performance. the 18-55mm is well made. the 18-135mm is over priced for it's cheap built quality. Yes, it feels cheap... when you rotate the zoom from extreme wide to tele. it feels catchy. the sales guys say its' the WR seal but I have Canon L lens and it's smooth. All the fuji lens are good value accept the 18-135mm. It's over priced. Go for the 18-55mm (2.8-4f). it's an excellent lens. it would be great if you could post a link to your high res tests between lenses you have reviewed above. Fuji did good job for UW OIS Zoom, and it is WR too. Yes mate, UW offering is really amazing ..
Could you find a detailed review of the lens, though? ohh but how incredibly small and pretty it is .. wow!! As far as I know Fuji 10-24 doesn't have any weather sealing. Where did you get the idea that it's weather-sealed? Thank you for the correction for "Fujifilm XF 10-24mm F4 R OIS" is not a WR lens. Umm...I had both the Canon and Nikon 24-70s and they're f2.8. It's basically the same with a bit more depth of field. I agree with adhall. It would have been nice to have at least f/2.0. It can be done but they are just not doing it. Sigma has an excellent 18-35mm f1.8. f/2.8 is too ordinary for APS-C. It could be done, but it would be huge. And then many including myself will question the usefulness of a mirrorless system. Dof applicants should rely on primes anyways. and no it doesn't matter if it's for DSLR or mirrorless as such as much, in terms of overall size and weight. The closest you are asking is new Samsung 16-50 kit, but again its slightly shorter on focal length and still not constant f2 as it also ends on f/2.8. It wouldn’t need to be huge. There’s no reason it should be any bigger than the existing Canon 24-70 f/2.8 for instance; definitely not huge. and Canon 24/70 f/2.8 is huge for a mirrorless camera and a lens with the double the price of Samy f2-2.8. so if its something you can carry, I do sincerely suggest you to carry Canon or Nikon fullframe in that boat of yours !! because by the looks of it size doesn't matter for you!! I'm not believing that lenses have to be huge, just because they have large apertures. The 50mm f1.4 lenses from Nikon and Canon are not huge. A zoom doesn't have to be huge either. I have no doubt that someone could make a 15-70mm f2 for APS-C size sensors, with image stabilization, which would be less than 500 grams. They might have to use a couple of titanium parts or some carbon fiber stuff, but it could be made ultra-light and produce great image quality in the center of the image at f2, good image quality all the way across the frame at f4 and very good image quality all the way across the frame at f8. Sigma could do it, but they're selling plenty of 18-35mm f1.8 and 50mm f1.4 lenses as is, so why would they make such a beast to eliminate a bunch of their sales of those two lenses? Tamron should do it. everything can be done... but with your specs, it would probably cost $10,000 to make. The problem is that many people ask for those specs but nobody is willing to pay the price. So lens manufacturers are not willing to make them. Their business managers do all the calculations with demand and how much people are willing to pay, and nobody in their right business mind will be willing to put the R&D into such a lense that they know only 1% of 1% will be willing to buy. very well said buddy cjhwang ..
precisely the point I was trying to make, its nice to have biggest possible aperture and focal length range in a lens, but then you dont wanna take the compromises. Every lens is made according to the intended system and market. like adhal and other friends here wanted to get fullframe euivalent dof but don't wanna mount a fullframe lens with an adapter or spend that much money for this system. all the benefit without sacrifice .. all i can say .. wishful thinking! also the big apperture zoom for even smaller formats are very expensive to produce and are very heavy .. anybody remember Oly 35-100 f2? its tack sharp across the frame, and ultra bright :)) but how many remember anybody buying it? F2.0 ?adhall how much would that lens be? $2400? Yes. it would be a comparable price to the current generation of Canikon 24-70 lenses. This is the kind of lens that professionals are looking for and this is the price professionals currently pay for such a lens... The point of f/2.0 is that it gets much closer to the DOF (and light gathering capability) of the equivalent FF f/2.8 lenses. well if light gathering capabilities + dof are that much important, go for fullframe :)) .. lenses will scale better on those bigger bodies and lens design will be simpler, as they will be to illuminate big sensor bodies without being ultra bright .. manufacturing f/1 for a 1" would be very complex, comparative to manufacturing f/2.8 for fullframe. an example is Oly 4/3 35-100mm f/2 PRO roughly 3k$ and 1.65kg lens, would you like to use it on an a tiny body? or rather go with Nikon 70-200mm f/4 with 1.4k$ and 0.8kg..
A lot of people are missing the point here. An f/2.8 standard zoom is an integral piece of kit for professional photographers. Even if Fuji's version is bigger or more expensive than another system, the point is that they're closer to having a complete system. So professionals who have dipped their toe in the water with primes can now comfortably use this as their main system if they want to. On its own it may not be the best value, but as part of a system it will get the job done. Yes mate, this is an option for you, if you need it, otherwise by all means go with 16-50 f/3.5-5.6 lens and save yourself money and heft. Can also get couple of primes with the price difference for more demanding situations. Looks good on paper, but the only kind of non-OIS lenses I have time for are sub-f2 primes or ultra- to wide-angle zooms. you are so right mate but I extensively use OIS or IBIS. So everyone is different. I still like this lens, I don't know, maybe gonna keep my tripod with me to compensate that. And i don't think that lens is too big, as many ppl write onto the net. no it's not, compare it with FF 24-70 from CaNikon or other APSC Sigma and Tamron lenses, it's alright. It's just that mirrorless people like to see smallish lenses to balance on tiny bodies, better. This would do great on XT1 tough. That's exactly i thought about it. It does have the right size & feel as X-T1 companion. The 77 filter is likely needed for the wide view at 16mm. I know some are complaining about it. I too hope Sigma does port over some of their better lenses; for example, the 8-16. A mirrorless-specific version can be designed even smaller and better. 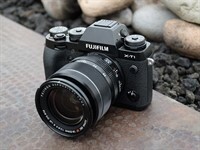 The new Fuji lens is huge making mirrorless not much of an advantage. The Sigma 18-35mm is excellent and for a very good price too. Other than being weatherproof, I would rather have the Canon 7D Mk2 with the Sigma. More versatile when I need speed for sports. The X-T1 is still a bit slow and not that much smaller than the Canon 7D Mk2. No OIS + 77mm filter thread make the purchase of this lens hard to justify at the offering price unless ultimate optical quality is what you want, and I'm pretty sure this Fujinon will deliver that. I wouldn't be surprised if a 3rd party lens manufacturer would come up pretty soon with a more affordable lens with similar focal length and speed + WR + OIS + 72mm filter thread for the X mount. Now that would be interesting to see, a real complement for the 10-24 and the 50-140 lens! It is missing one liking "FUJI XF 10-24mm OIS", but FUJI is missing the most popular FL zoom - the one just released, but w/o OIS. I may spend some time to looking into NX1 system's performers; Body + Lenses. Currently there is a NX 12-24mm f4-5.6 lens which is very good and sharp. Rumors there will be a S grade lens 11-24mm f2.8 OIS coming this year for the NX line. "S grade lens 11-24mm f2.8 OIS" will be great. Now if it was a 14-55 2.8, I'd not care how much it cost or weighed. That would cover all of my Fuji primes in one optic. I don't need the WR spec as my 18-55 got soaked daily for almost a week and never skipped a beat. It's small size meant less glass to catch stray drops. I was very impressed with it and the X-T1's resistance to mechanical/electrical faults due to moisture. That'd be an awesome lens and perfect in a travel kit with 1 more lens (either longer zoom or Samyang 12mm for me). I'd want the WR, though. Did they really put 17 elements in only three groups? What Barney meant to say was 17 elements in 12 groups. It's fixed now. Both are very much the same price as expected. "Take you time" should be read as "Take your time". Yo are right. For the same SPEC with same quality, Adding OIS will double the price, and increasing the size/weight noticeably. But, for a zoom, the wider the FL, the higher the price normally. Save the argument for 12-24 is only 2X. The (major) reason that I put both Fuji together is for people think "OIS is useless for a sub-frame 16-55mm lens". It is always interesting to see people states "OIS is useless for a sub-frame 16-55mm lens". Oops, It is 10-24mm with OIS, not "12-24 is only 2X". A truly interesting lens and from the specs it looks like a perfect allrounder for me. I had a Tamron 17-50/2,8 lens and I really loved it for it´s combination of useful range and fast aperture. However the optical quality was not that great and also I could imagine a bit wider and longer end. This new Fujinon offers both: wider (with 16mm I could live without other wideangle lens) and 5mm at the tele end is nice too. Seeing the complex and expensive optical construction and knowing the quality of Fujinon XF lenses I expect nothing but superb optical quality. To this point everything looks great. However complicated construction means big and heavy lens which somehow negates the advantages of a CSC. And paying 1200 EUR for a standard zoom is insane. I know I cannot compare it to the cheap and subpar Tamron 17-50 for 1/4 of the price, but comparing to my Sigma 18-35/1,8 I cannot stop wondering why the Fuji has to cost 70% more than the optically amazing Sigma. The Sigma is optically top notch (Art line) and construction-wise a more complicated lens (it has f1,8, i.e. 1,3 EV faster) and costs 700 EUR. I somehow cannot convince myself to believe the Fujinon is worth paying 1200 EUR. P.S. all the thoughts are of course theoretical, since I do not own a Fuji CSC and compare CSC lens to DSLR lenses. If I had a Fuji CSC, I would have no other choice if I wanted a zoom with similar specs. None OIS Lens should be much cheaper than with OIS. BTW: I like Sigma Art line, and it worth the money. For years, I only have one Sigma had issue, lost sharpness in one corner after heavy use. You still have your point - but don't over-exaggerate the argument, by comparing street-price of a year old lense against a just released ones UVP. The FUJI is all metal construction, the Sigma has a plastic barrel, and the FUJI zooms from 16-55 and the Sigma only zooms 18-35mm. They are very different lenses. Conrad: they are of course different, but the shorter FL of Sigma is outweighed (construction-wise) by much better luminosity (which is an optical challenge noone has repeated by now). Btw. the Sigma build quality is top-notch, easily on par with my all-metal Limited Pentax. Thorsten: the Sigma´s MSRP at launch was 799 USD, so the difference to Fujinon launch price is still considerable 400 USD. In different words: Fujinon is 50% more expensive then the (groundbreaking) Sigma. Iudex: The sigma lens is a VERY different lens. It has a VERY limited zoom range, and is unusable as a primary lens for portrait work, where as the new Fuji will zoom plenty long enough for that. When the Sigma came out I was intrigued, and the reviews I read gave serious props for image sharpness. The bokeh in my opinion is a little nervous looking...borderline fuzzy wide open. Again that is my opinion. All in all it is a lens I would pass on because it only zooms to 35mm. It is what I would call a novelty or travel lens. But given it's size I would still opt for the Fuji 18-55mm f2.8-4. My point is that it has it's strengths; sharpness, price. It also has it's weaknesses; bokeh, very limited zoom, and lack of weather sealing. It is like comparing a Ferrari to a Yacht. Both serve their purpose, but neither are designed to do the same thing. Conrad: The Sigma is of course limited due to the short focal range, however it still covers the most used focal lengths. Re: "is unusable as a primary lens for portrait work..." which short standard zoom is a PRIMARY lens for portraits? None. For portraits you need much longer FL, ideally between 85 and 150mm (I use 100mm), so whethet the standard zoom reaches 35 or 50mm is from this perspective irrelevant. Anyhow these standard zooms are all competitors since they cover the most used focal lengths and none of them can serve as the only lens, they are not long enough, nor wide enough and need to be accompanied by other lenses (UW, portrait, tele). So for me they are alternatives (and I actually changed from 17-50 to 18-35). ... so instead of e.g. 18mm, 27 mm and 35mm primes you have only one lens covering it all and - most importantly - with comparable outcome and quality. Anyhow I do not by any means want to bash the Fujinon, on the contrary, I like the Fujinons useful focal range and if I had to choose only one single lens, it would be this 16-55/2,8. Iudex, I went to Disneyland last summer with my kids. I carried a 23mm 1.4 one day and the 18-55mm 2.8-4 the other. There is no doubt that the two lenses took very different looking photos. I actually own the 14mm, the 23mm and the 35mm, but generally use them for "artsy" type photos, or for walkaround lens on the street. I prefer the zoom for vacation photos for obvious reasons. The 18-55 is equivalent to 27-84mm on the FUJI, so it works as a portrait lens as well, not a great one as out of focus blur is limited, but it does the job. The Sigma is of course equivalent to 27-53mm which is a wide to normal length. Like I said, it is a great travel lens, but not if you intend on taking portraits. The out of focus blur might be great with the 1.8 rendering, but image compression would be severely lacking, making for an unpleasing looking close up of people. Anyway last I checked, Sigma isn't making lenses for the XF mount anyway. Iudex, I also own the 55-200, the 50-140, and the 60. All of them are stellar lenses and some of my lenses double up what I already own for my FF 5D iii. I love how the Fuji's perform and as I have said many times on this site, the colors are awesome. Especially skin tones right out of the camera. Sometimes, like when I shoot a wedding for example I have to use the FF camera or even my Hasselblad MF. They are heavy and expensive but they do what my FUJI just can't do. I wish their was a "perfect" system so that I didn't have to have 3 different systems, but their just isn't. The laws of physics won't allow it. But not everyone can afford 25K in equipment like I have, so kudos to FUJI for making lenses that will work better for different situations. They won't work the same, but I will guarantee that the 16-55 2.8 will work better for a wedding than the 18-55 2.8-4. But I am glad that the 18-55 is made because I would never want to carry the 16-55 around all day at Disneyland. Of course you are right the 18-35 cannot in any way serve as portrait lens, whereas 16-55 at tele end can (i used my 17-50 at 50mm and f2,8 for portraits and it can be done, however it is not ideal). As I said, 16-55/2,8 is great universal lens and I would be quite happy if something like this was made for Px mount. OTOH there are people who get on with only prime lenses (you said that too) and the Sig18-35/1,8 can substitute easily lenses like Fuji´s 18mm/2, 27mm/2,8 and partially the35mm/1,4 without the need of switching. The Sigma is not very light, that´s true, but I travelled (hiked) a whole day holding the camera in one hand without problems, so a lighter Fuji 16-55 would be perfectly portable for me. But we got far from the initial thought that the Fujinon is pretty expensive and big given it´s "only" f2,8, nas no OIS and is made for CSC with shorter flange distance. Maybe the price falls down later, right now it´s a pretty pricey glass. Iudex: All very good points. I have no problem with the size, if that is what takes to design an optically superb piece of glass. The price is high...and you are correct that it will fall. I have seen virtually every lens they make fall drastically in price within a year or two after release. But Fuji knows that there is a percentage, myself included, that will always pay the opening premium. Generally new lenses by Fuji are so popular that Fuji cannot keep up with demand for the first couple of months. I had to order my 50-140 from Japan because there just were none available before Christmas here in the USA. Happy shooting! On paper, the Samsung and Fuji look very close. The Samsung loses F2 at 18mm,per the little video. They both have 3 Asph lens and two EDs and MC. OIS on a wide to medium tele is not that useful. For long tele I would what it. But some how IQ must suffer from it. They both look look like nice lens. I think Fuji has abetter over all range of lens and cameras....also the Trans-X sensor with no AA creates very sharp images. And the new X-PRO / X-T are on their way. I like prime less, owned the 24-70 Canon, great lens, sold it, I like primes. So, if you like having only one lens, this may be it for Fuji owners. Knowing the history of Fuji opitics, it will please their owners. So forget the f2.8 is not really F2.8 and it is too big or someone else makes a better. If you own Fuji, you know better.
" OIS on a wide to medium tele is not that useful." I beg to differ. OIS (or IBIS) is always useful regardless of focal length (kudos to Canon for adding it to some wide angle primes recently) and means you always have a more capable bit of kit than someone without. OK, so people who were never going to even lay a finger on this lens have spoken out. 2. Big and heavy. Physics and metal construction at work. 3. F2.8 is not the same as something else that I also don't own. Hooray, we have heard you. Now hurry off to FB and gloat about how you set us straight. Who is your "we", FUJI? This should be a lure for people considering Fuji, as I have. As a Pro level standard zoom it is competing with the Samsung equivalent, which is f2-2.8. However, the Samsung does include IS. The question is, does full f2.8 offset IS. For many people it will not. From what I have seen, at this point I would choose the Samsung combo for the IS lens and the new APS-C sensor in the NX1. As a Fuji user I'm a bit disappointed. It is big, and heavy. At that size, it should have OIS. Fuji has long standing expertise in OIS, but I hope this is a clue that Fuji is working on IBIS. It is a far more elegant solution. I hope it is in the fabled X-Pro2. In the meantime, this is where I start longing for the jewel-like Oly 12-50 2.8 and an OMD M1 to use with it. Fuji should ask Samsung for how to design lenses. What crap. Fuji have been designing high end optics for years even for cinema. Samsung have no optical history, but they do have a great history of stealing ideas from everyone they can, including Apple, etc. And why a samsung user would come onto a post about a Fuji lens when they are completely separate systems sure beat me. Fanboys and trolls are the curse of the internet age. Samsung optics are actually quite good, and they have one of the biggest R&D team in the world, unlike some fruit company which overhypes everything others already have done years ago with flashy words. 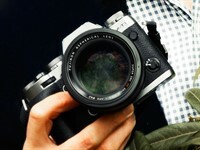 Check the facts - samsung has made NX mirrorless cameras BEFORE sony releases NEX. They also pioneered the 180 degree selfie LCD in their compacts. I know you, you are the GUY uses LEICA but never own a FUJI b/c FUJI is "Poor man's LEICA" per what you said. 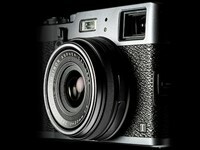 That's fine, you buy LEICA, but NOT FUJI X100x. BUT: Meanwhile, You were all over the place to ask help for the issues of your FUJI. That's not good, Peter Bendheim! May be you are used to it, BUT NO GOOD AT ALL! Peter Bendheim! Great, buy one then. Like all Fuji glass for their current cameras, this will be a very nice lens too. Mike FL, I have no idea what you want to express here, not a single sentence of your post makes sense to me. "Samsung's 16-50mm F2.0-2.8 with OIS is looking pretty good right now..."
Besides, you don't need IS on a wide lens. I never had any trouble before, the likelihood of camera shake is irrelevant if you are shooting people because they will move before you've finished taking the shot. And if you shoot landscpaes get a tripod and do it properly! Peter Bendheim will help you for "I have no idea what you want to express here, not a single sentence of your post makes sense to me.". @Hugo, I think you are confusing things... @50mm (75mm equiv) it is not wide. and I do have a 30mm f2 lens without IOS - so what? I am referring to this category. I think Fuji simply failed to impress here. I wanted to buy a Fuji in the past, for their lens specs. I am merely pointing out how humiliated they must feel being bested by Samsung. use tripod instead of IOS - ROTFL! @Peter Bendheim, it seems to me that flaring comments are characteristics of trolls and fanboys. You hating Samsung and loving a manufacturer responsible for deplorable savery workign conditions and with a half a trillion in their bank account, doesn't entitle you to say that all companies, other than the ones you personally buy, are copycats. Retrace the history of every single camera patent, and let's see how much copied stuff is in the brands that you use! and btw, Apple ripped off Xerox's graphical user interface - they didn't invent much - just copycat and marketing doing the rest. Timmbits. I had a 18-55mm lens with my first Nikon and didn't need IS. When I broke it and brought the new version with IS I thought it was a hindrance rather than a help. Just because you had a bad experience with one lens, doesn't mean that all lenses with ios arent any good. dont let a bad experience cloud your vision. if you have a flat on a radial tire, are you going to stop using radial tires? The artificial rage about so called trolling with the Parkinson comment is so far of the topic. Just don't call people trolls if their opinion differs and move on. We don't all run after you to try to fix your "Apple-Xerox" rip-of theory, even if it's a tired old cliche. And Mike FL, again your comments do not make sense in this conversation. Just stay on topic, which is this lens and not what you read somewhere that somebody else used. Timmbits. Well done for heading straight to the bottom of the barrel. First off, I did not tell anyone they had Parkinsons if they do not share my opinion. Second, no I didn't used to take a tripod out with me ever and I hand held shots down to 1/8 of a second regularly with a f5.6 Nikon lens on my D40. Now imagine what results you can get with a 2.8 lens! No slower but darker light. This is why Fuji don't include IS - because it aint necessary. The main point I make is that if you are photographing people, having IS is pointless compared to having a fast aperture because people move. Ask a professional wedding photographer if you don't believe me. High shutter trumps slow every time. So don't worry about the lack of IS on this lens unless your hands shake uncontrollably. If they do buy the slower one and save a few quid. The best Samsung NX compete in optical quality with the very good, not absolute best, Leica and Zeiss lenses. They are optically better than Fuji lenses. Clearly the lens maker for Samsung, Optron, knows something Fuji doesn't. At least HP manages to put good sound cards in their Android tablets and Windows laptops, unlike Apple and the iPad and MacBooks. So Apple should do some stealing. Not sure about "So Apple should do some stealing", but Apple is being sued by Monster as now. Mike FL - I have no idea what you are on about at all. I have two Fuji cameras, and a few Canons. I don't own any Leica's. You comments just make no sense. I just have no idea what the relevance of Samsung lens are on a topic about a specific Fuji lens. It's like someone is on a very specific thread about a baseball team and you and the dude before you come on and try have a discussion about swimming. Really, its beyond any logical comprehension. I'm on here because I am a Fuji user. That doesn't mean I won't and don't criticise the brand. Using a product does not mean I'm blindly wedded to it. but really what you say just makes no sense to me at all. "Samsung have no optical history, but they do have a great history of stealing ideas from everyone they can, including Apple, etc." Perplexed about the lack of OIS, given that the wide angle 10-24mm has it. There is now one less compelling reason to purchase this lens over the much faster primes. OIS most likely requires IQ compromises. A moving element is unlikely to be stable even when the feature is disabled. Note that Canon and Nikon did not add this to this FL in their line as these are standards of the industry. They didn't put IS in this lens so they can release the updated version 2 next year with IS. Timmbits, you already know the Samsung is better? If so, go and buy it! Adding OIS makes any given lens BIG, HEAVY, SLOW, EXPENSIVE. Fuji say "NO", and shows you on this "XF 16-55mm F2.8 R LM WR" comparing to Samsung "NX 16-50mm F2.0-2.8 S ED OIS" which is weather sealed too. This Fuji lens has NO OIS, but BIG, HEAVY, SLOW, EXPENSIVE vs Samsung. Fuji, update your Lens Road Map, to see what do you get for the next year. I think Fuji have shown how good there lenses can be eg the 18-55. Samsung as good? Unlikely despite the extra desirable features. I wonder if the lack of OIS is a signal the the X-Pro2 and the successor to the X-T1 will have internal stabilization. Otherwise the decision to not include it on this lens makes no sense. As an X-T1 owner with the 10-24, 18-55 and 18-135 zooms, I ordered this lens last night, about 2 hours after the announcement appeared, from B&H. After thinking about this decision, I will probably withdraw my order due to the weight of the lens (more than any of the other zooms) and due to the lack of OIS. I love the 18-135, but it's already verging on the "uncomfortable to carry all0day" zone. The difference between this lens and the 18-55, is only 1-stop at 55mm the bokah is fine, and it's only half the weight. I love mid-telephoot lenses, but at the long end, I doubt if the bokah is better than the 60mm f2.5 that is even faster and ⅓ the weight. Therefore I think I'll save the money until the (hopefully OIS-equipped) X-Pro2 body comes out later this year! Anyway to read this as a 1 page instead of 7 pages of mid-size thumbnails? Agree completely. The slideshow format is expremely annoying. This is not a celebrity tabloid website. "we suspect that the triple threat of a fast-aperture, excellent build-quality and quick AF [will] win over a lot of enthusiast X-series users." I think the double threat of size and no OIS will equally deter quite a few. I bought a large no OIS lens for my 70D: the Sigma 18-35 f/1.8 but in addition to excellent IQ (even wide open) it makes up the 1 stop of light crop loses to FF and at 35mm at the long end, OIS is not really useful - either your subject is stationary which means you have the option to use a tripod or improvise one or your subject is non-static in which case OIS is useless anyway. I really wish Fuji tries something as daring. Perhaps a 10-30mm f/2 lens? Now that would not need OIS and, paired with the 56mm for portraits, would be a great kit for everything short of extreme telephoto applications. For "OIS is not really useful - either your subject is stationary which means you have the option to use a tripod"
this FUJI 24mm-82mm WR, it is mainly for OUTDOOR walk around street shoot, But I like your ideal to bring/use tripod. BTW: Fuji $1000 XF10-24mm has OIS. I was talking about the Sigma 18-35 when I said OIS is not useful there. At 35mm at the long end, you don't really need IS. On the other hand, the Fuji definitely could have benefited from some IS; esp. since it doesn't seem to have translated to any size/weight savings. Because every enthusiast wants to run around with a big f 2.8 zoom on vacation. Right. This looks like a great lens. Well done Fuji! While Nikon and Canon are stilling on their hands producing the same old, out dated rubbish and expecting us to buy. "dated rubbish" is a way simplistic term there. Bet Canon sells more Rebel XTs in a week than Fuji sells XT1s. Similar idea with the Nikon D5300. Nikon has recently updated its 1.8 lens offerings, and they have way way way better value than anything other mirrorless system provide yet. Check prices, optical performance (and weight) for Nikon`s FF G line, 20, 28, 35, 50, 85mm, all f1.8, and the 24-85mm zoom and compare the files a Nikon Df or 610 or 750 coupled with these lenses puts out as compared to the Fujis. And then you will realize: dated rubbish never looked so sweet. As far as aps-c and the new 5500 are concerned, you certainly make some good points. Canon has a great range of lenses but their APS-C camera lineup is pretty poor. Nikon FX systems are great, especially the new 750, but compare a Sony A7 to a D610? There is a big size difference between the Nikon DX and FX bodies, not to mention the lenses. And Canon + Nikon APSC DSLRs sell, in quantity. Sony has taken a very scattered approach after acquiring the Konica-Minolta photo division. Panasonic and Olympus have taken a more thorough, steady, approach once they settled on the m4/3s mount. So unless you know you want an m4/3s system, or only one or two lenses with your new body, a Canon or Nikon makes a lot of sense. Then there's the OVF thing--which is better, and will remain so, in many circumstances. @Mirko123. Well there's the stm range - 40mm, 10-18mm, 18-135mm, etc and 15-85mm plus 70-200L mm lenses and the primes - 300mm, 400mm etc and the more budget range - 18-55mm. 55-250mm, 70-300mm, 50mm 1.8 etc etc etc Largest range of all manufacturers for APSC and FF. "we suspect that the triple threat" - Nice one, dpr! A Canon 24-70 wt is 805g, 1.77 lbs. The Fuji only is 655g, 1.44 lbs. All fast and wide lens are goinr to large, but this is a one lens for just about everything. Remember, the X-PRO is APS-C and some cameras like the Nikon 7000 series is nearly as big as nomal FF Nikon. The lens factor is 50% less, the wt factor will about the same. Did you exspect an 16-55mm F.95 should only wiegh as much as an 35mm F/1.4. They make other lens that cover this range that lighter, buy one of those. This a Pro level and they work for a living. Canon lens is 1.5 stop faster in equivalence. Oops, nerd2 your math is off. Think again. FF 2.8 and APS-C 2.8 is not the same sh!t! Otherwise my iPhone has a f2.5 lens which makes it faster and better than your 16-55 2.8 right? F2.8 is F2.8. A FF may have more light gathering, ergo the image is less noisey. That has noting to do with the lens. The lens is not a sensor. Perhaps you can solve Unitified Field, be for you go to bed tonight. BozillaNZ, f2.8 is f2.8, no matter if it as APS-C, FF or MF.